Eight easy storage solutions that minimize clutter. 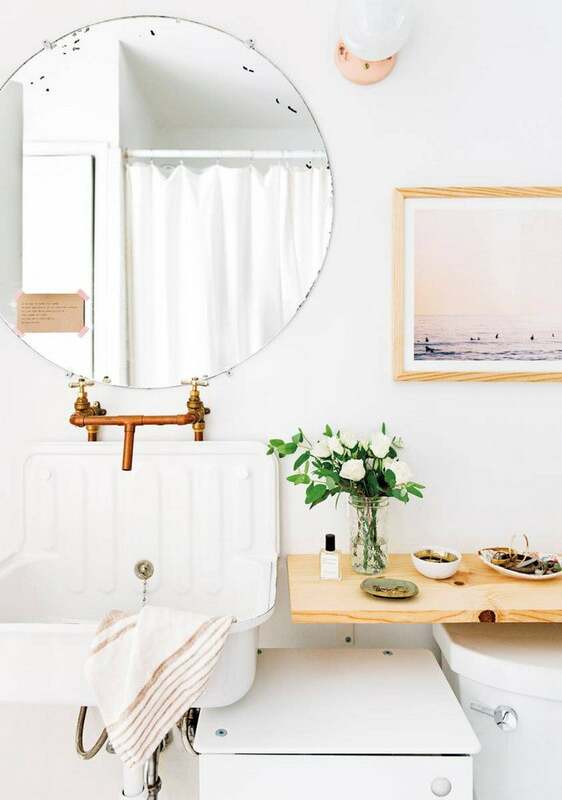 Keeping the bathroom free of clutter can be one seriously trying feat. The sole fact that you are limited to keeping your essentials in that one specific room makes everything all the more challenging, especially for small-space dwellers. Think about it: when it comes to the living room, bedroom, or even the dining room, it’s easy to be versatile with how you approach your storage—books, accessories, and clothing can be seamlessly transferred from one room to the other. But when it’s the bathroom in question, it’s highly unlikely that you’ll be storing your accessories or beauty buys in any other spot of the home. Enter: the clever solutions we’re using to store the essentials (i.e. this handy shelf-turned-extended-counter conveniently installed aside the stand-alone sink) to help you make the most of what little space you have. Read on for the helpful tips and tricks we’re swearing by to get our bathrooms in tip-top shape. Most bathrooms don’t come with the luxury of built-in storage, aside from the lone vanity or medicine cabinet—and so, here is where we learn to rely on alternate sources of storage, with a focus on a variety that is versatile in form and function. A streamlined shelf is key, as is one that can be easily integrated into a compact space. Invest in a standing shelf that can be used to house everything from towels to the extraneous (i.e. plants and florals). If you haven’t heard, caddy trays are the one item no bathroom (or bathtub, for that matter) should be without and coincidentally, they happen to make for quite the ideal storage solution as well. Utilize one to house everything and anything from your bathtime essentials to your best beauty buys. While keeping your slew of beauty products or what have you, in the medicine cabinet—to eliminate countertop clutter, of course—is definitely something we encourage, sometimes, it makes sense to keep the more frequently used items easily within reach. Here is where the vanity tray comes in. Bring in a compact tray—let’s not get crazy here—to house a curated selection of items you find yourself using on the daily. You will see that you’re significantly less likely to leave items out on the counter, as its designated spot already exists within said area. Lacking space in the shower? Bring in some outside help, preferably in the form of a hanging caddy. Better yet, free up the edges of the bathtub—no one loves the serious grime that accumulates underneath shampoo bottles—by storing your essentials in one compact spot. If you have room to roam, utilize a mini side stool for storage, preferably one that can be paired with a chic clawfoot tub. Baskets and bins are a saving grace when it comes to containing clutter. You know this, we know this, so let’s collectively agree to invest in a solid set to keep our spaces clean and pristine. Ultra-forgiving and quintessentially versatile, you can use said baskets to store your most unsightly essentials, keeping the vanity or shelves free of the superfluous. Oh and, bonus points for labeling the boxes with chic tags or labels. No bathroom is complete sans a medicine cabinet but alas, there are times where the latter comes sans the former. And herein lies the problem many are faced with, especially when it comes to finding viable room to store items. Luckily for us, there are a handful of ways you can fake it—one being this very versatile and affordable option from Ikea. Need something slightly larger in size? Convert an old bookcase or standing shelf to double as one—given you have the floor space to spare. If you’re lucky enough to have the room for it, install a set of wall-mounted shelves, to keep your go-tos within easy reach. Utilize mini baskets, toiletry kits, canisters (the list goes on and on…) to keep the extraneous to a minimum and everything beautifully contained.